DUBLIN (CNS) — Church and government officials paid tribute to an aid worker for the church’s international development agency who died following a road accident in Guatemala. Sally O’Neill worked for Trocaire — the Irish word for mercy — for some 37 years in developing countries. The charity announced her death April 8, following the accident. “We are heartbroken by this news,” said Trocaire CEO Caoimhe de Barra. “Sally was the heartbeat of Trocaire for almost 40 years. She was a truly remarkable person. “Trocaire was only 5 years old when Sally joined. Sally built the foundations of the organization. She embodied our values and, through her courage and commitment to human rights, touched the lives of so many people,” she said. Describing O’Neill as “my friend,” Irish President Michael Higgins said he was “greatly saddened” by the news. He said O’Neill “distinguished herself for four decades through her commitment and unstinting belief in the dignity and inherent equality of all human beings. “Having translated for (St.) Oscar Romero just six weeks before his murder, she would go on to engage with all those suffering in El Salvador, Honduras and Guatemala,” Higgins said. He said O’Neill “understood the importance of combining tangible assistance and practical compassion with the pursuit of long-term solutions to the root causes of poverty, marginalization and oppression. “Through her work, she empowered countless people and she was relentless in calling on those with power to bring their influence to bear on the policies and politics that affected those most vulnerable,” Higgins said. A native of Northern Ireland, O’Neill joined Trocaire in 1978. She worked primarily on Trocaire projects in Latin America but was also involved in providing famine relief in Ethiopia in the mid-1980s and established Trocaire’s program in Somalia in the early 1990s in response to a famine there. Before her retirement, she was Trocaire’s head of region for Latin America, based in Honduras. 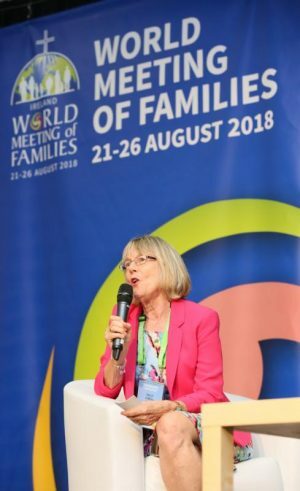 Following her retirement, O’Neill continued to work in a voluntary capacity as a facilitator with prisoners and migrants in Honduras, where she lived. As well as her ongoing work with human rights organizations in Central America, she lectured in development studies at the National Autonomous University of Honduras in Tegucigalpa.